Great piece to close the shape of small blasters: the silencer of the Stealth Kit. This barrel extension is normally available only in the Nerf Modulus Stealth Kit. But those who need only on this silencer, can get it here individually. So everyone can choose the accessories that he really needs. 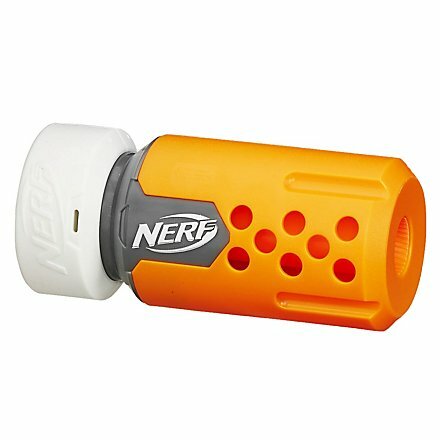 The barrel extension in the silencer design fits all blasters with a barrel attachment point. The barrel covers the attachment point well and so provides an aesthetically pleasing finish - because the adapter point disturbs some blaster purists. At the same time it is short enough to reduce the range hardly. As a tip: The silencer looks particularly good on the Retaliator or Rapidstrike. The silencer is packaged in a plain cardboard box. Through this type of packaging Hasbro not only protects the environment, it is also less expensive than ornate colorful boxes. The quality of the content itself is not affected, of course.